This off-season Scottish Escape tour is the perfect way to appreciate the beauty of Scotland’s rural landscapes, as well as the energy of its cities and iconic sites. Your escorted vacation begins in Scotland’s largest city—Glasgow. You’ll take a guided tour of a whisky distillery, visit Stirling Castle—home to Scotland’s Kings and Queens—and explore the sights of Glasgow as well. Travel along the “Bonnie Banks” of Loch Lomond, and see awe-inspiring Rannoch Moor, Glen Coe, Loch Linnhe, and Fort William beneath Ben Nevis. Keep an eye out for the Loch Ness monster, and learn about historic conflicts between Scottish clans. Spend the night in the Scottish highland capital of Inverness, and see the mountain resort of Pitlochry, and the legendary home of golf at St. Andrews. Cross the Forth Road Bridge to Edinburgh, to spend three nights to see the historic sites, such as Edinburgh Castle and stunning views. Make your escape to see the best of Scotland, while enjoying reduced crowds and prices on the off-season. 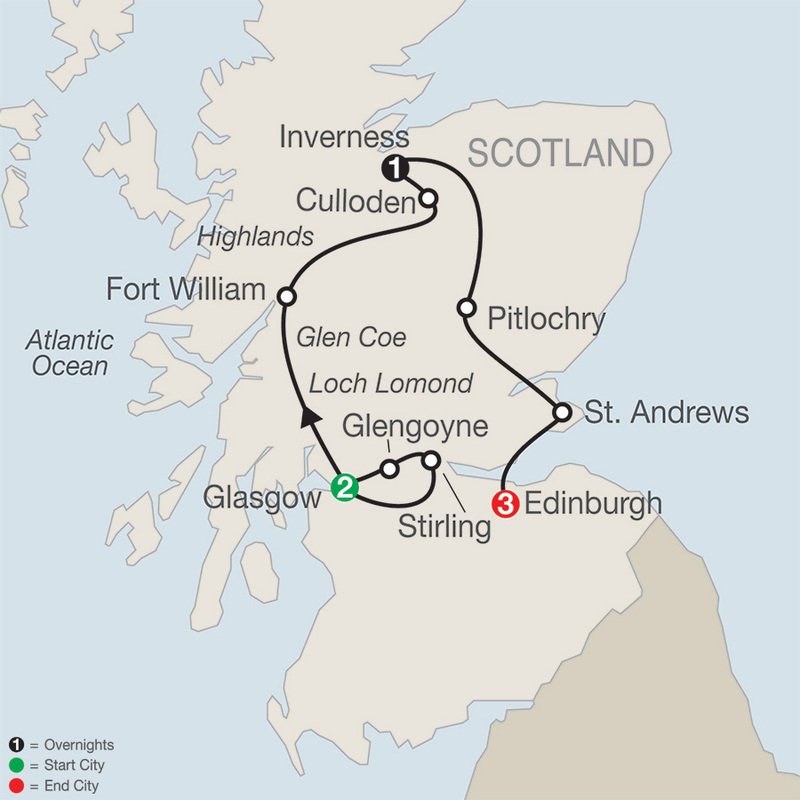 You’ll enjoy your guided tour of Scotland all the more! DAY 1 ARRIVE IN GLASGOW, SCOTLAND. DAY 2 GLASGOW. STIRLING EXCURSION. DAY 3 GLASGOW–FORT WILLIAM–CULLODEN MOOR– INVERNESS. Jurys Inn Glasgow is very well positioned to explore Glasgow and its beautiful old buildings and monuments, from breath-taking Glasgow Cathedral to George Square, offering guests a taste of Glasgow's rich history. The hotel has a newly refurbished bar and restaurant, The Grill Bar, and there is also a contemporary restaurant. Enjoy warm Highland hospitality in Old Town Inverness at Mercure Inverness Hotel. Rebuilt on the site of the original Caledonian Hotel, the modern hotel is just 200 meters from Inverness train station and a caber toss from the city's numerous pubs and restaurants. Courtyard by Marriott Edinburgh is the newest edition to the Scottish capital, combining heritage and style with an innovative design and locally inspired furnishings. The hotel has a prime location, just a five-minute walk from Princes Street and Waverley Station. Spacious, modern hotel rooms include quality amenities, such as a selection of in-room entertainment, plush bedding, and a work desk. Meals are served in The Lantern Room and the lobby offers an innovative and sophisticated space for working and relaxing.